100 percent natural solid antique gold granite pool basin. A sleek design available to be scaled to fit your application. Carved in the marble or granite of your choice. Dimensions: H: 7" W: 89" D: 26.5" View Colors Call Us! 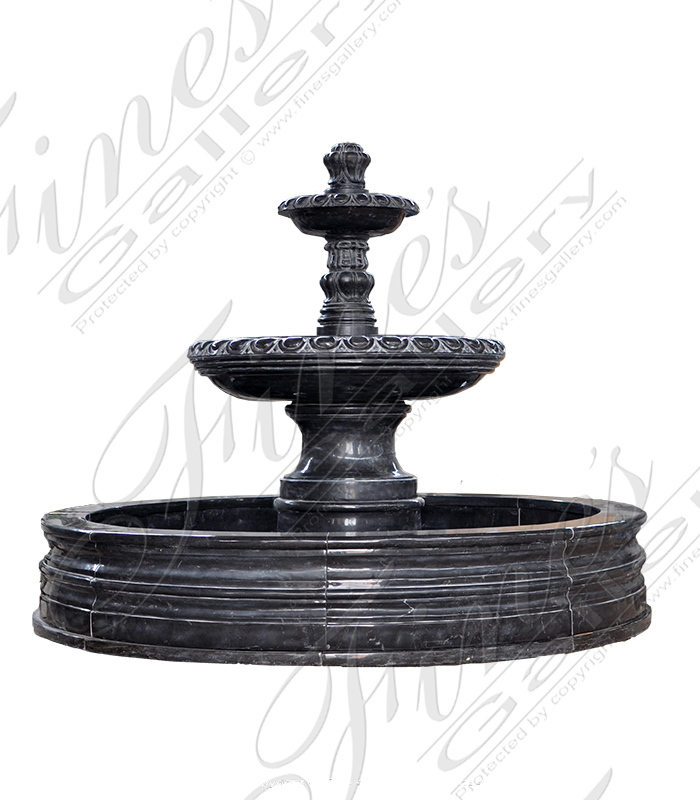 Rustic Black Granite Fountain two tiered design with circular pool surround. 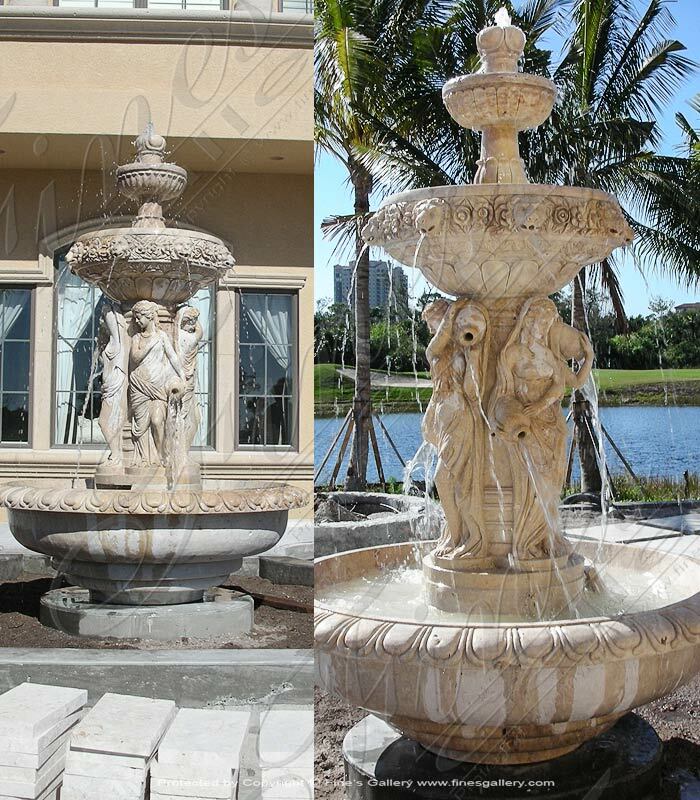 A traditional style garden fountain with egg and dart design. 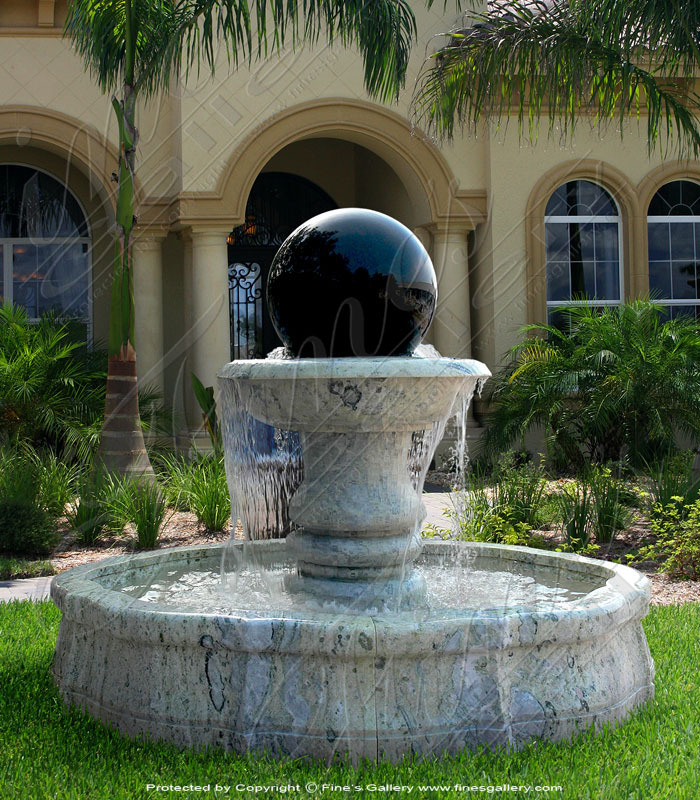 A flat black marble perfect for exterior garden application. Available in marble, granite or travertine. Dimensions: H: 63" W: 83" D: 83" View Colors Call Us! Dimensions: H: 42" W: 84" D: 84" View Colors Call Us! 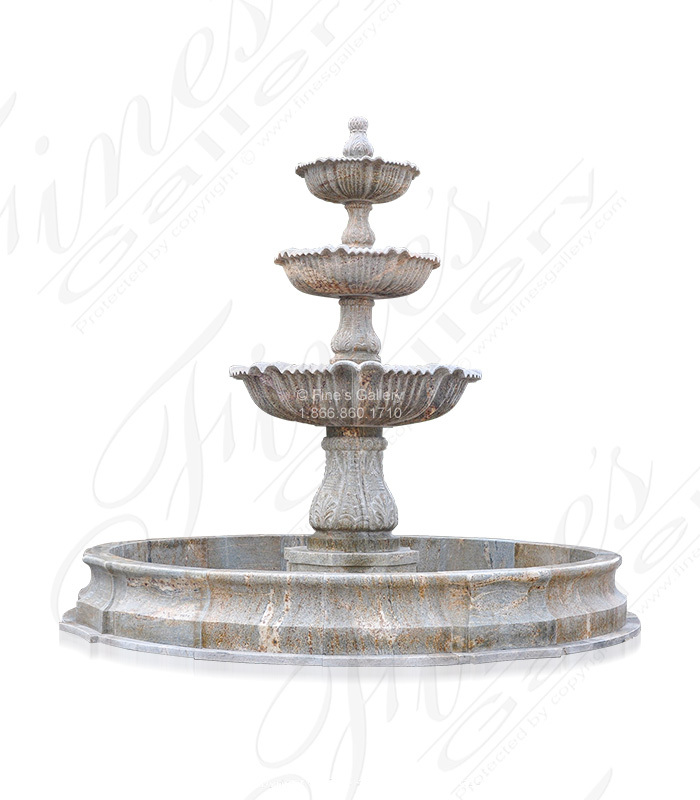 This appealing French Garden Fountain in Granite is perfect for your luxury motor court or garden area. 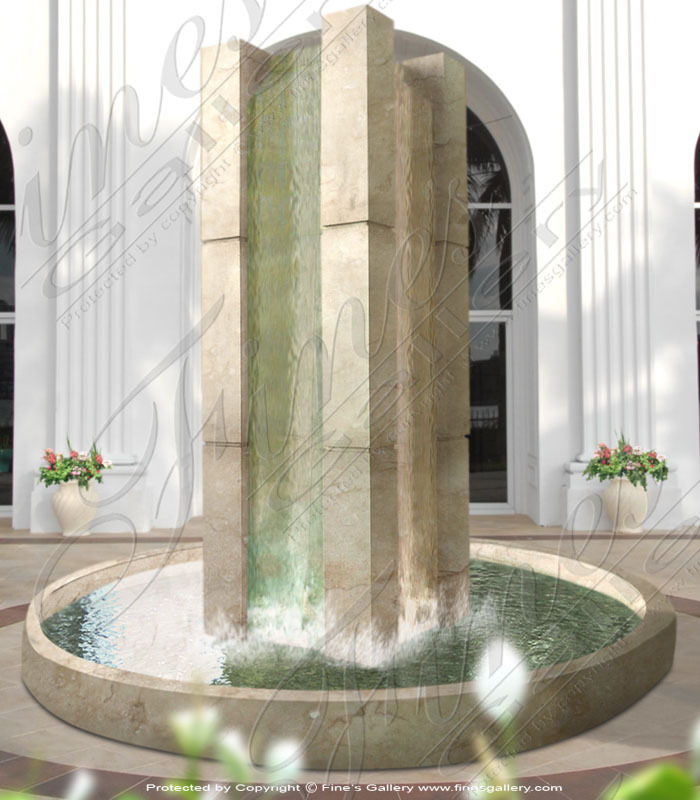 Our draft team can design this to your size requirements and we'll carved it from the natural stone of your choice. Dimensions: H: 113" W: 144" D: 144" View Colors Call Us! 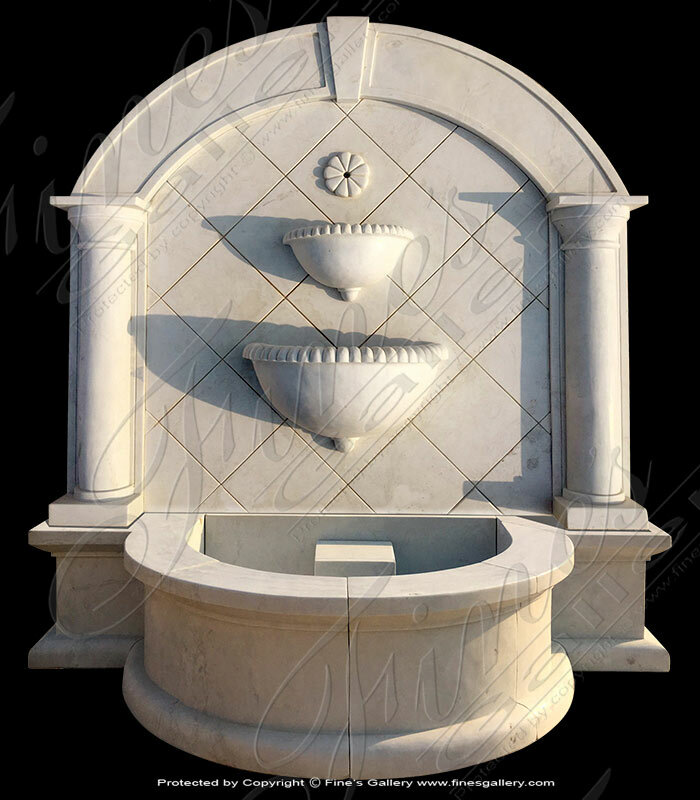 A very clean transitional tuscan Pure White Marble Wall Fountain. 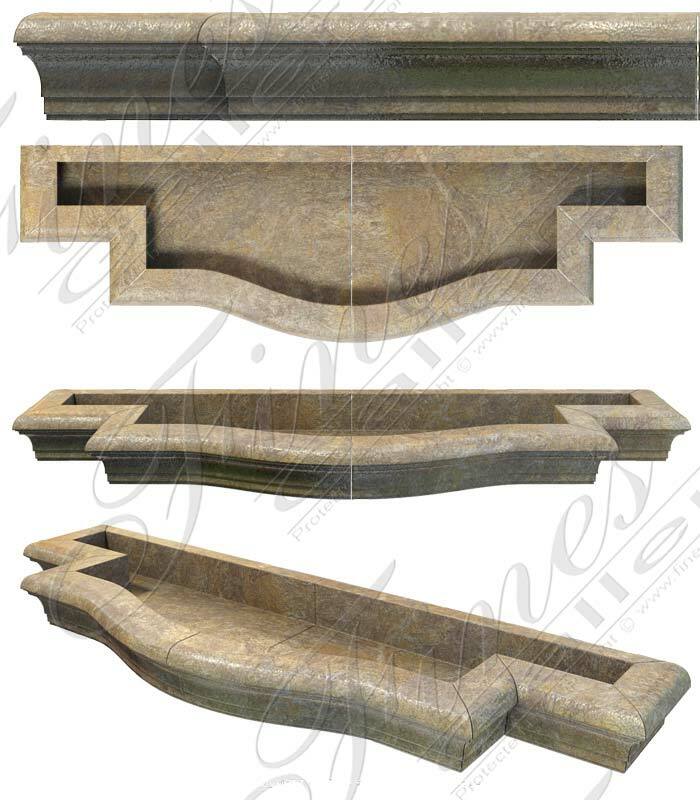 Incorporate our natural stone concepts into your architectural plans. We can design them according to your space. 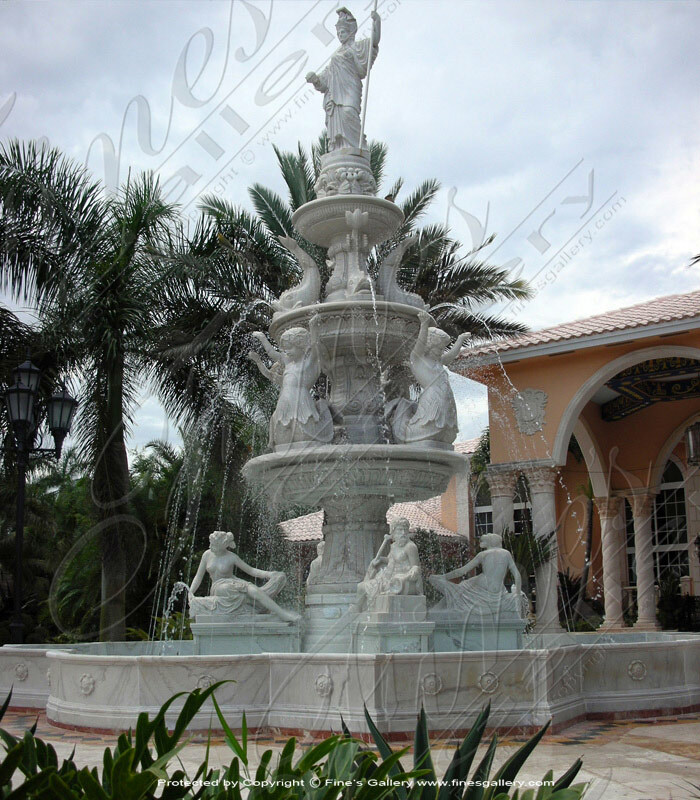 There is no job to big or too small for our fountain experts. Dimensions: H: 84" W: 78" D: 39" View Colors Call Us! 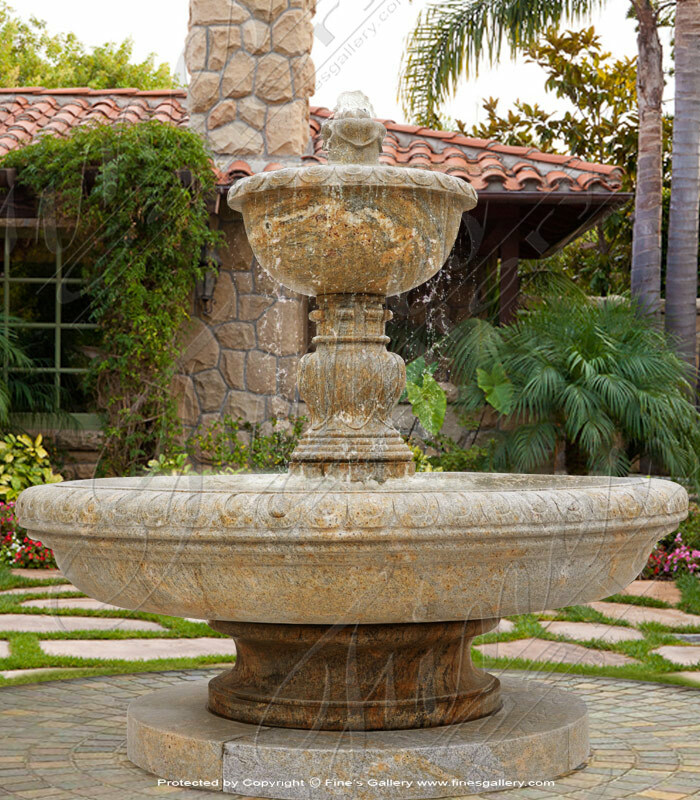 Oversized Granite Fountain. 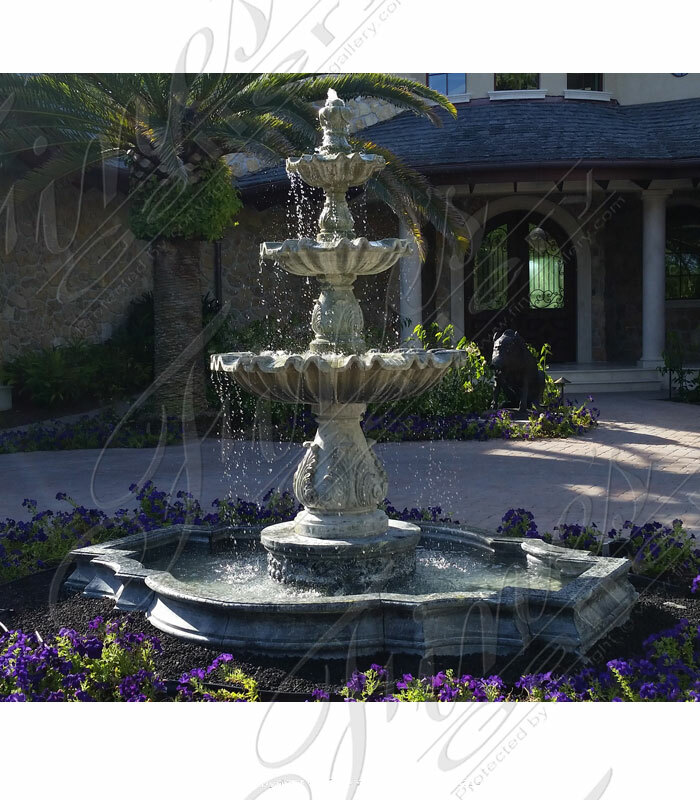 Three tiers granite fountain at 12 feet tall. 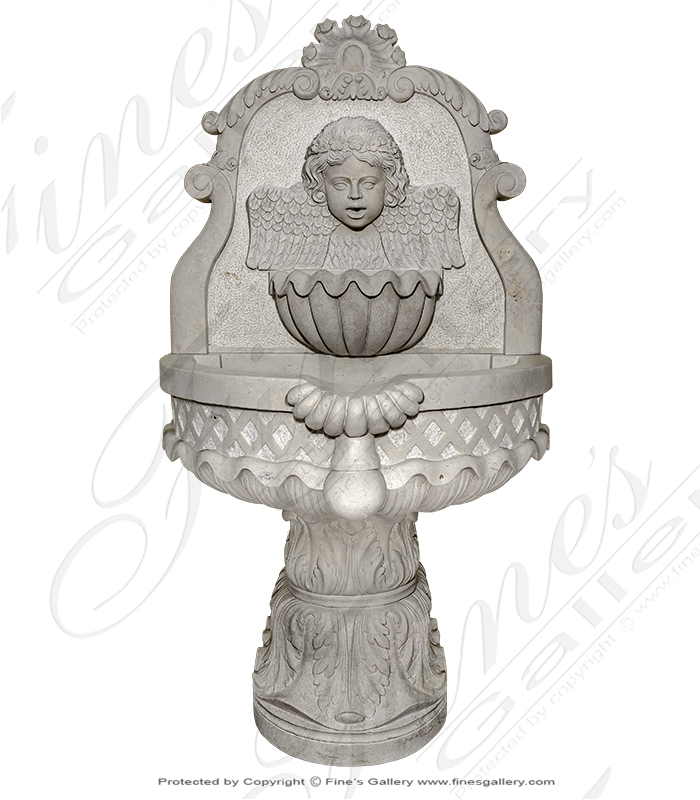 Very refined deep engraving on each pedestal support with finely carved scalloped edge on each of the tiers. In production. Dimensions: H: 144" W: 162" D: 162" View Colors Call Us! 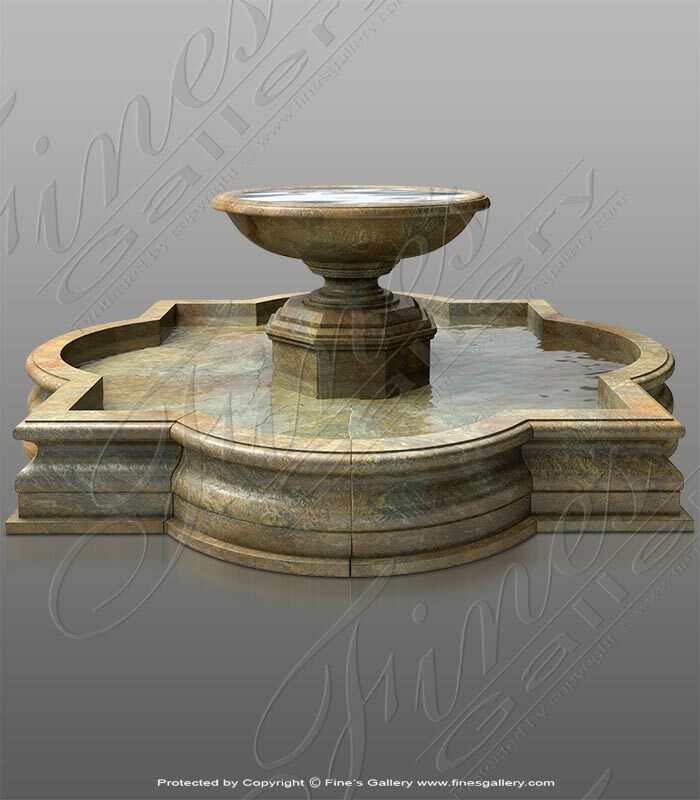 Granite Water Feature featuring a quatrefoil shaped pool basin and one very clean central tier. Water flows at heavy volume from the center bowl. Add LED lighting for amazing affect at night. Dimensions: H: 52" W: 144" D: 144" View Colors Call Us! Corner Marble Pool Surround. Featuring a 90 degree angle to fit perfectly into any corner. 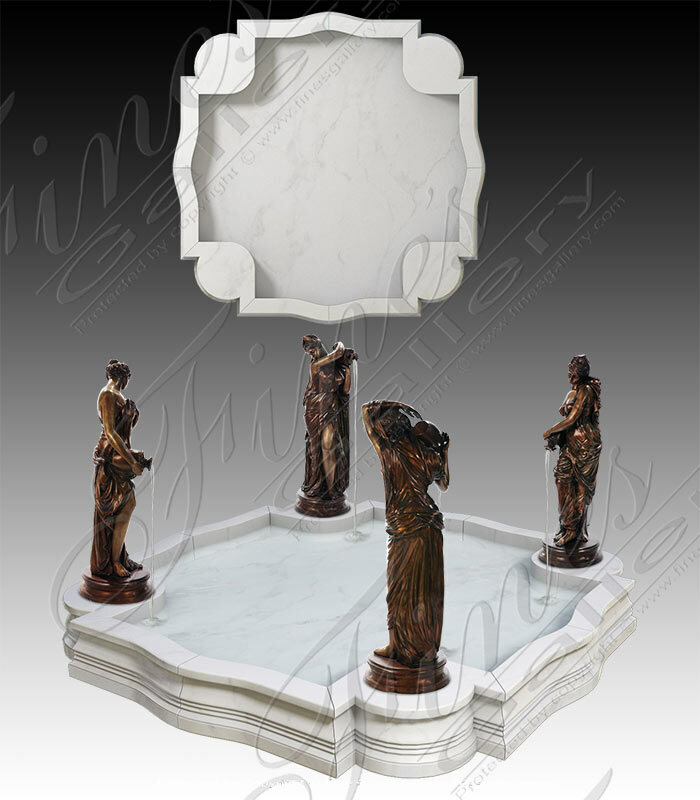 Shown in pure white marble, also available in granite or travertine natural stone. 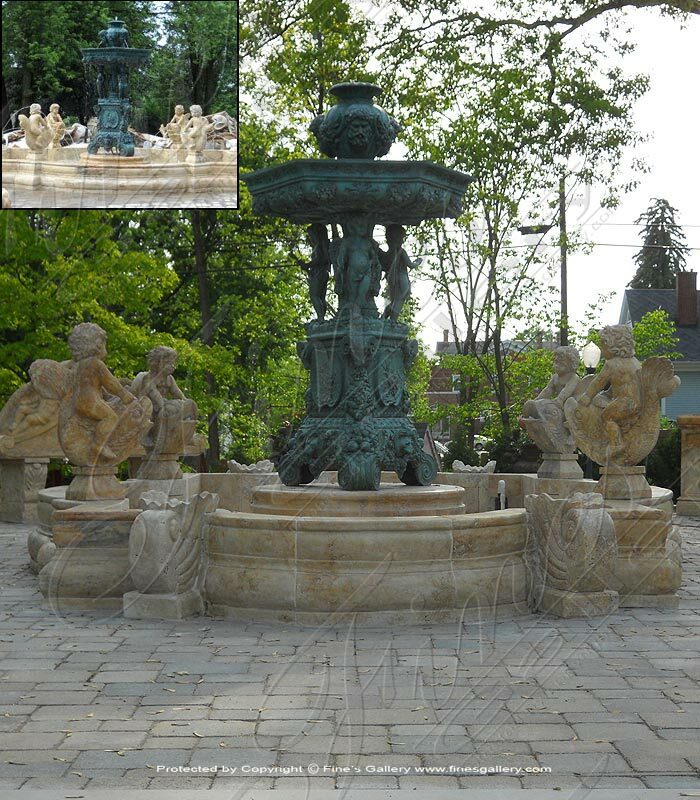 Shown with optional bronze fountain features, available with tiered fountain. 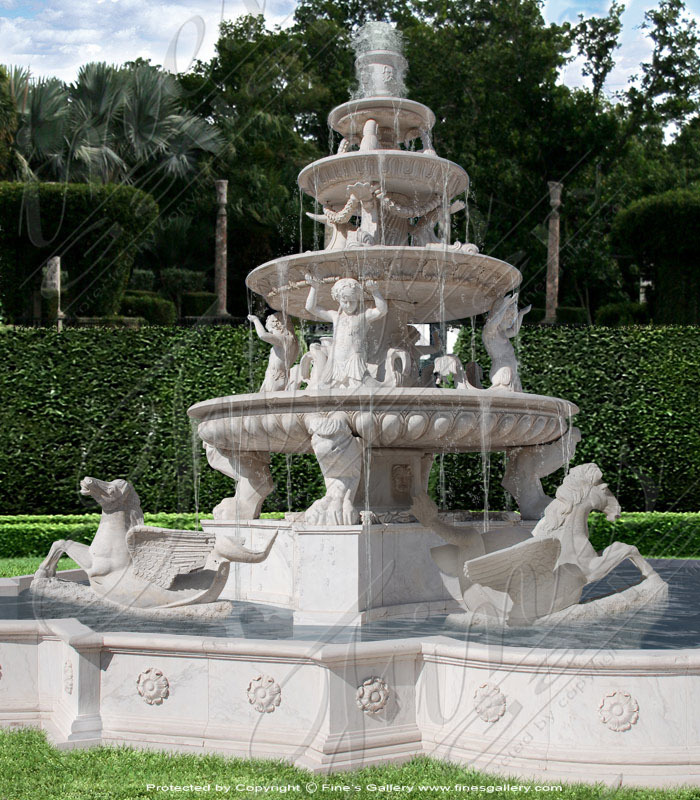 This elegant Statuary White Marble Pool has been designed to incorporate four marble or bronze statuary fountains. 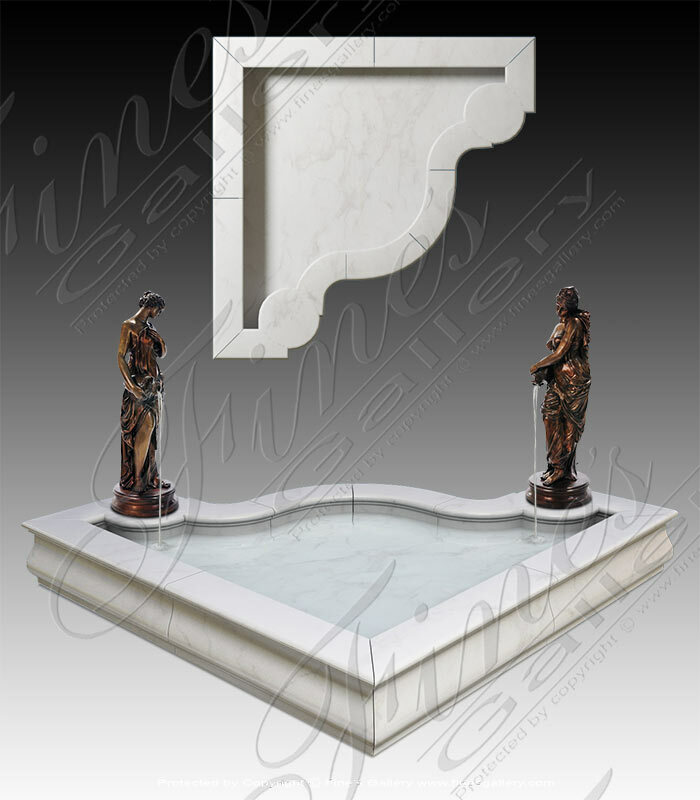 Carve from natural stolid marble, also available in granite. 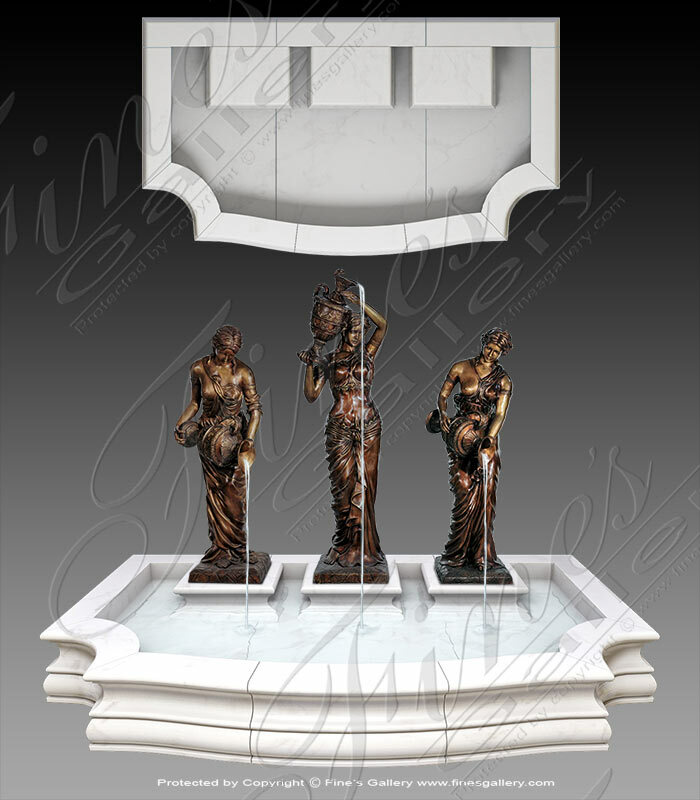 Three Greek Ladies Marble Pool Feature. Solid pure white marble, available in beige marble and and earth toned granite. 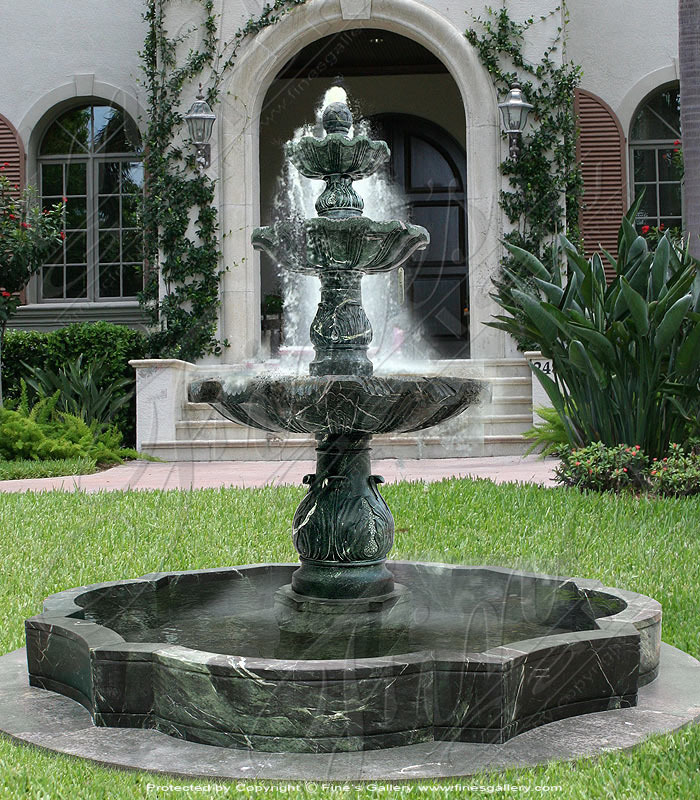 Luxury Estate Fountain in Verde Marble. 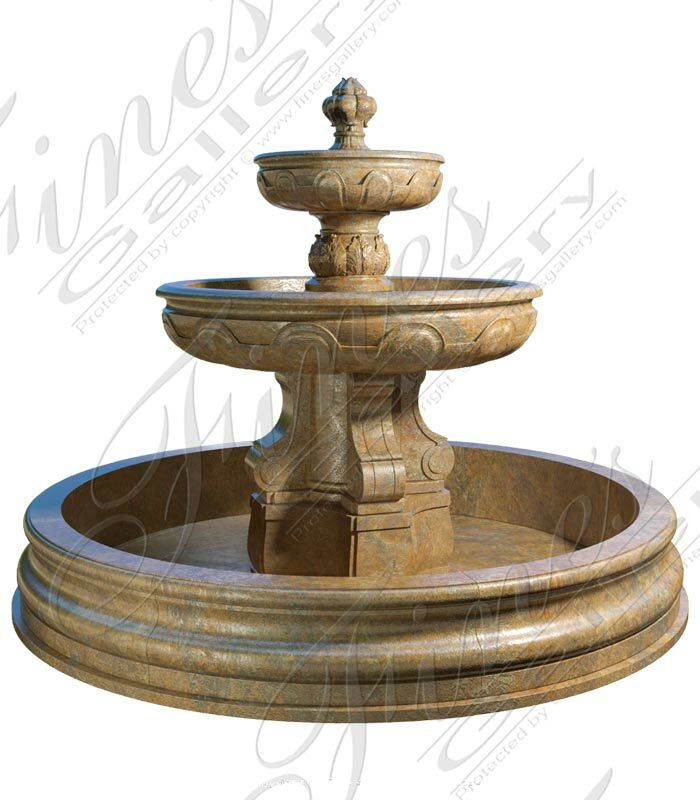 An oversized three tiered scalloped edge fountain feature set inside of an oblong quatrefoil shaped pool basin. Carved in a stunning natural light verde marble. Available to be custom sized to your requirements. 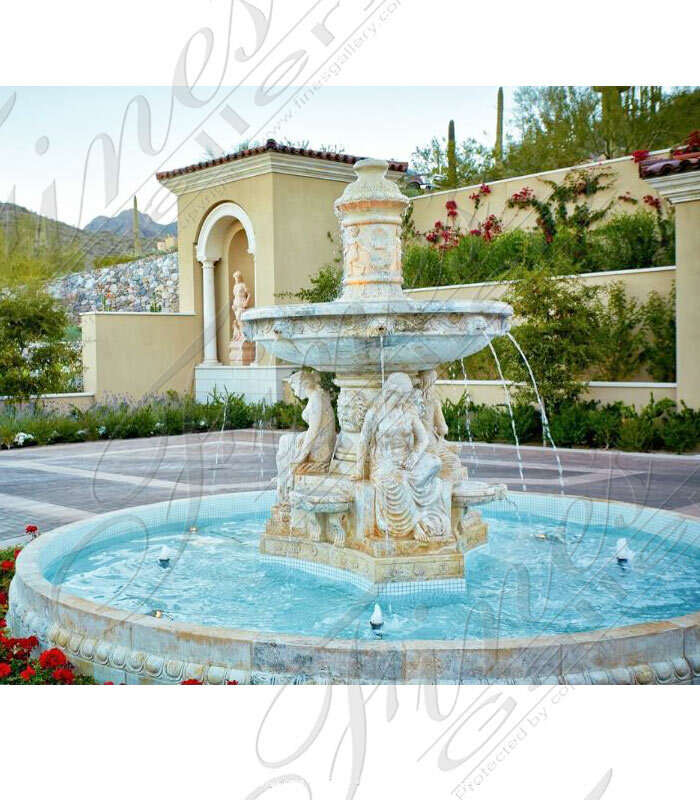 Old World Fountains of Rome in Travertine Marble installation shown here in Scottsdale AZ. 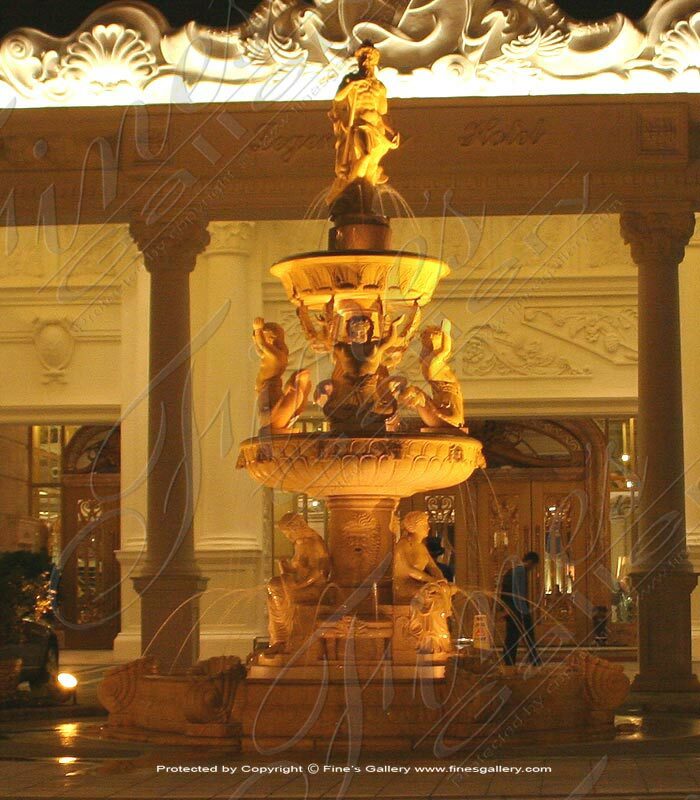 Included were several containers full of custom designed natural stone custom designs including luxurious ornate hand carved mantels, urns, statues and much more. Dimensions: H: 104" W: 180" D: 180" View Colors Call Us! 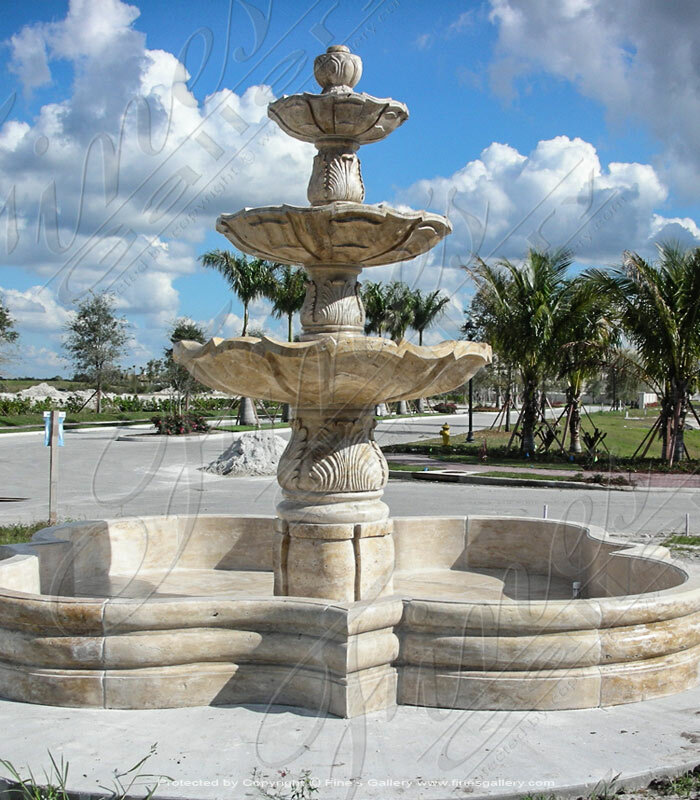 This fountain feature is located at a Florida Gated Community. A Large Mediterranean Fountain in Travertine. Also popular in granite and marble. 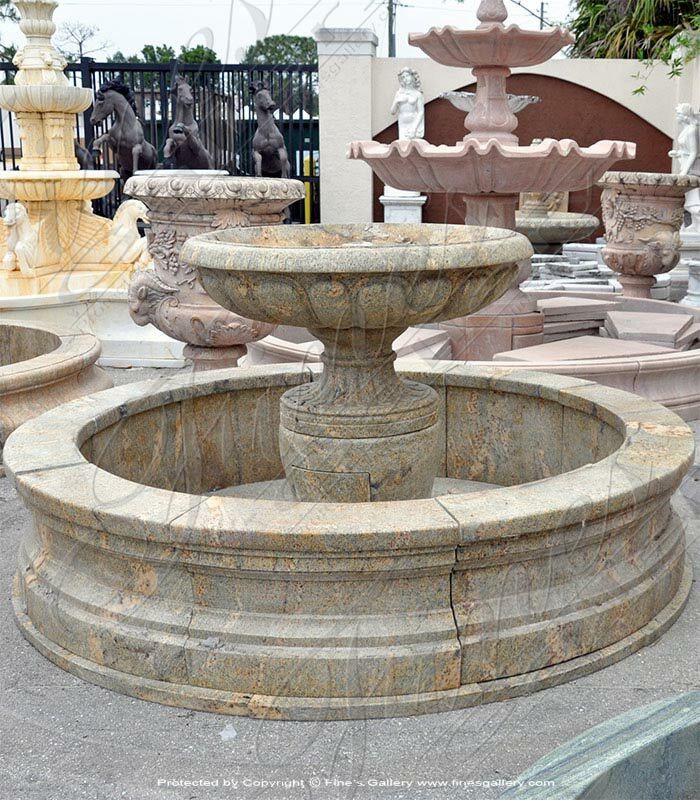 Visit our unique showroom here in Southwest Florida and view hundreds of rare fountain features in marble. 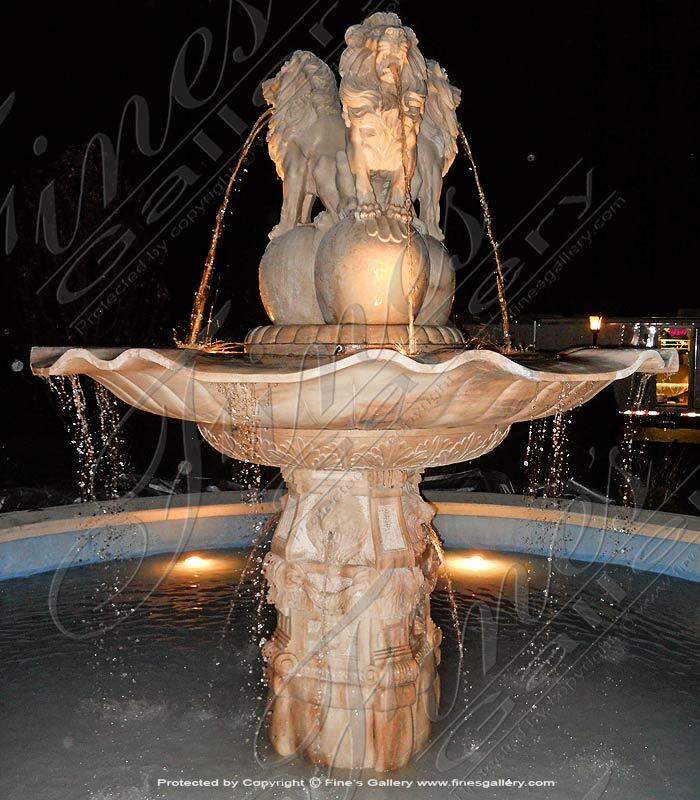 Roman Travertine Ladies and Lions Fountain Feature. Installed at a South Florida Mansion. Visit our massive showroom in Southwest Florida where you can view a huge selection of rare and unusual natural stone and bronze creations. Customize today! 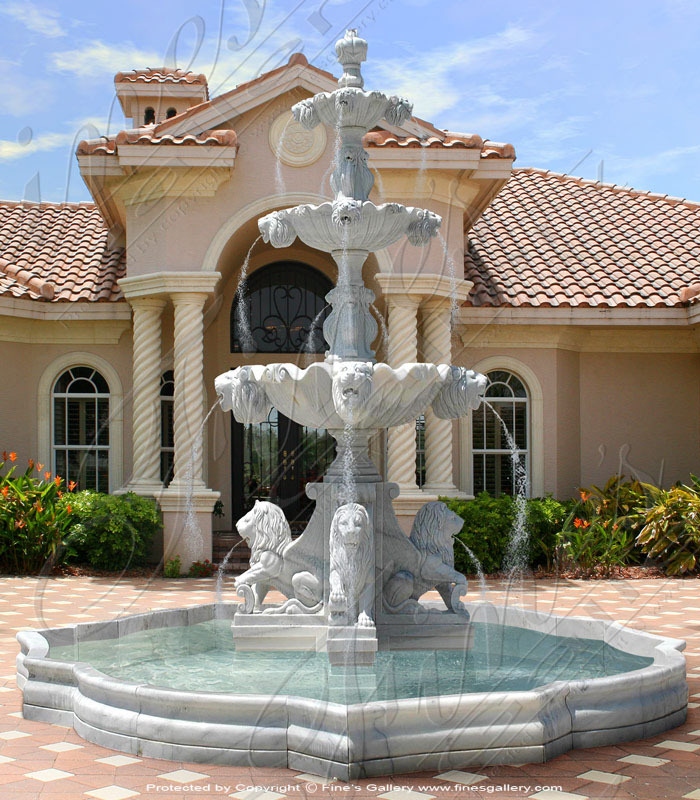 A Regal Marble Lions Fountain Feature carved from a peach colored marble. Masterful italian style hand carving installed by an expert stone mason. Our staff of designers, carvers and affiliated installers is second to none! 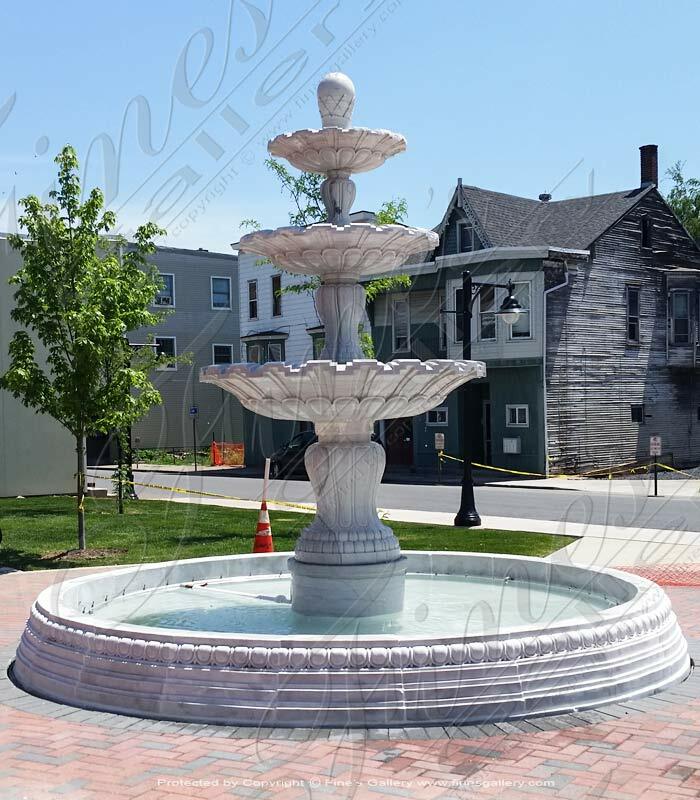 Commercial Outdoor Fountain Installed in Central PA. 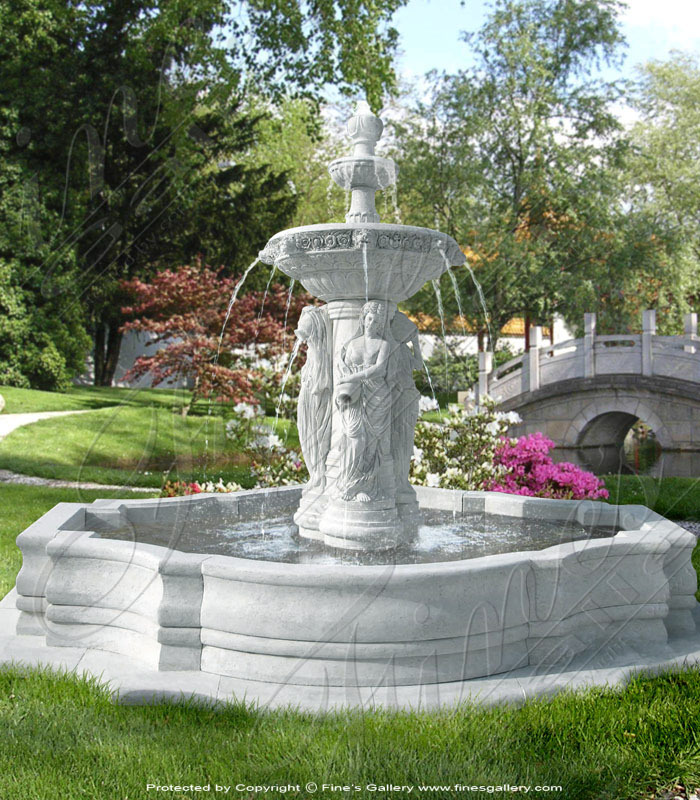 This solid pure white marble fountain feature is an outstanding feature for any high end residential or commercial property. We can scale this to fit your requirement.